Okay, so I woke up this morning feeling nasty, and spent the day loafing in my PJs (eh.....it's now 8:30 and I'm still in my PJs....soooooooooo lazy). But PJs and all, I still managed to haul my carcass into the kitchen to create some sort of culinary concoction for hubs and I to enjoy. On the menu for today was a recipe that I adapted from the January issue of Vegetarian Times. Seeing as I didn't want Vegan Week to merely be a rehash of recipes and foods I already knew and loved, it seemed like a good idea to experiment with new kinds of protein and different recipes....this latest edition of Vegetarian Times kindly had an article demystifying such enigmas as tempeh (coming Friday) and seitan (as I said, not to be confused...). I had a heck of time finding this mysterious glutinous protein, even within the confines of the natural food store. Nothing like feeling like a fish out of water (oops....should that be soybean out of...um....uh....anyway) than going into that store. I stared and stared at the soy protein/meat replacement fridge and couldn't find this stuff. So I had to go ask, and of course the lovely store lady stared at me like I was an idiot and pointed me right back to where I'd just been staring for ten minutes. My non-vegan status now unveiled for all to see, I scurried back over and eventually found what I was looking for. I actually really enjoyed the seitan - despite is spurious moniker, it really did have an enjoyable texture, and to quote hubs "You can make this even if we're eating normal food." Ah, the great accolades of success. 1. Take the seitan out of its package and rinse well, patting dry. 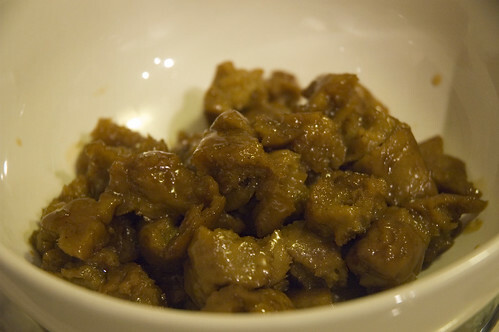 Going along the "grain" of the seitan, shred it with your hands. 2. In a large skillet, heat 1 T sesame oil. Toss in the seitan and saute until browned (about 3-4 minutes). Meanwhile, combine the orange juice, soy sauce and maple syrup in a small bowl. 3. 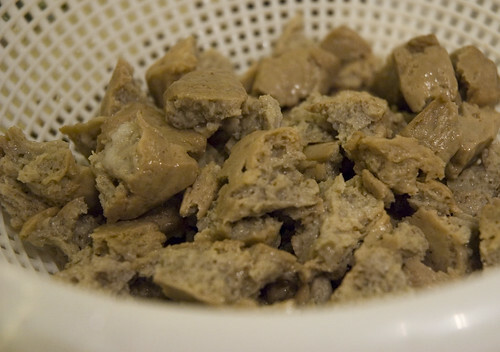 Add the mixture in with the seitan, and allow to bubble away until most of the liquid is gone and the seitan is "glazed." Put the seitan in a bowl and wipe out the pan. 4. In the dry pan, toast the almonds until they are fragrant....try not to slightly burn the crumbly bits like I did. 5. Put the almonds in another bowl. :) Mix together sauce ingredients for the stir fry. 6. Heat 1 T sesame oil in the skillet. 7. Add the soybeans (mine were still frozen at this point). A minute later, add the garlic, ginger, red pepper and broccoli. 8. After 2-3 minutes, the broccoli should turn bright green. At this point, add in the seitan and the sauce ingredients. Let this boil until the veggies are done to your desired doneness (I like mine still a bit crunchy!). 9. 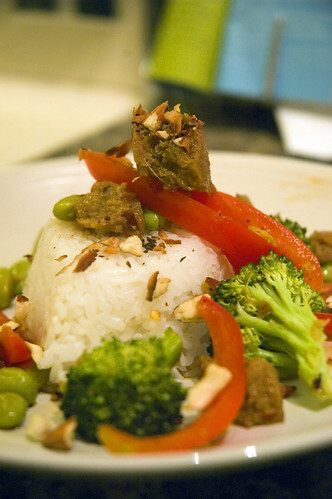 Serve over rice and sprinkle almonds on top. mmmmmmmmm......very yummmy.....if you can get over the fact that the seitan squeaks on your teeth a bit. It's tasty stuff though! So far, Vegan Week is now half over, both hubs and I are still energetic and (somewhat) healthy (pounding headaches and all...meh). I think I'm getting all my vitamins (although supplemented with my kinda non-vegan multi) and I have totally been enjoying this. :) Hubs has enjoyed it too! So....some of you meat-eaters, try a vegan meal or two....you never know, you might like it! Hey, which store did you get the seitan at? Thanks!